Have you ever been stranded on the side of the road, or stuck in the pits because of a broken shift linkage on your transmission? It’s a nightmare for Porsche owners. 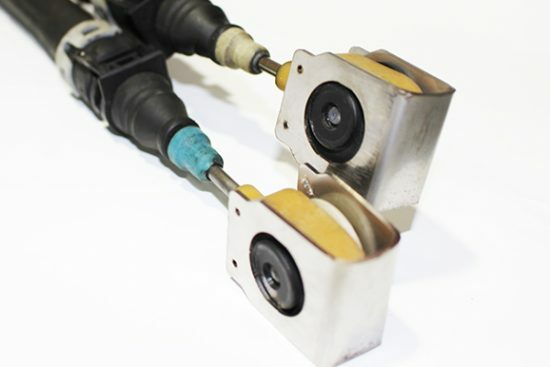 We have a very simple solution to keep your shift cables from breaking off. The rear shift linkage on your Porsche is a weak point and the plastic coupling that holds itself to the transmission selector becomes very brittle and breaks, causing the cables to come off from the transmission. This leaves you stranded in whatever gear you may be in and has also caused problems for many people at the track as well, ruining their track day. These TRS shift linkage security clips ensure that the cables will not come off of the selector and hold them on tight. Straight forward and easy installation. Manual Transmissions Only! Can Not Be Used On Cars With Tiptronic transmissions. While we can provide step by step instructions for installing these Shift Cable Security Clips on your Porsche we suggest you consider whether you are equipped with the appropriate tools, time and mechanical inclination before taking on this project yourself. Some of our clients have performed this service themselves and we have complete faith in our customers. If you are not sure about whether you can handle this yourself then we highly recommend you contact us at 954-345-7877 to make an appointment. If you are not anywhere near our facility in Coral Springs Florida and can not transport your car to us then we highly recommend you visit our list of reputable independent TRS installers and distributors.